Bulkmatic Sampling Screws are designed to extract material sample from a stream of material flowing down a chute. The screw is designed to pick up material through a slot at the top of the screw and draw the material to a flanged outlet on the side. Provision has been made to purge the screw through an off-centre slot at the bottom of the screw when the motor is run in the opposite direction. Precision laser cut flanges, side walls and screw conveyor tube slots ensure a quality finish with consistent hole spacing on the flanges. 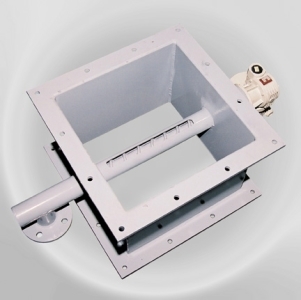 The standard unit is compatible with other Bulkmatic equipment such as rotary feeders, flap valves and knife gates. Standard outlet flange is a NB50 SABS 1123/1000 flange. Other flanges can be supplied on request. Standard material of manufacture is mild steel. Stainless steel 304 or 316 units with a quick release mechanism can be supplied for food grade applications. Round units are also available to suit customer specific flanging and chutes. Standard sizes include: 150, 200, 250, 300, 400, 500 and 600. Other sizes and configurations are supplied on request.